This article will detail some of the things to look for when purchasing curing equipment. If you already have some of this equipment maybe you will find ideas for your future upgrade. If you are just ready to make your first purchase then hopefully you will find some tips you can use to stump the salesman. I hate to admit that when I first got in this business no one had “invented” flash-curing units. We all played with various heaters hung over a printer but the manufacturers were slow to respond. Now you can’t do quality work without a flash heater. If you don’t own one then you better put this on the top of your wish list. Before we talk about features of flash-curing units I want to clarify one major point. I have lost count of the THOUSANDS of times I have had people call to say that a salesman told them they COULDN’T get a full cure with a “spot heater/flash cure unit.” I find this humorous because I personally know of THOUSANDS of people who have been using flash-curing units (or spot curing units – yes, they are the same thing) for years. In fact one former student of mine claimed to have done $400,000 in one year out of his garage using homemade equipment and four flash-curing units! A flash-curing unit is simply the SAME HEATER THAT’S IN A CONVEYOR DRYER without the conveyor or tunnel. And, since these are infrared heaters that do not heat the air but only heat what the infrared radiation touches, you really don’t need a tunnel to contain the heat. Anyway, the reason they are called flash- or spot-cure units is because if you put them close to the ink you can get a cure in only a few seconds. Heater Size- Since there are so many large prints if you get anything under 16″x16″ you are kidding yourself. I would invest in a 16″x 20″ or even a 24″x 24″ if possible. The larger units are 220 volts but the size is worth it. 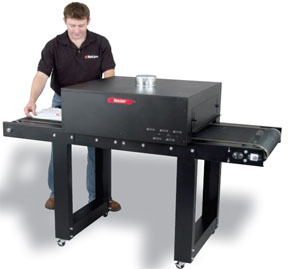 Size of Stand- If you have ever tipped over a flash-cure unit you will know that a sturdy wide-leg stand is a must. Wheels are also indispensable because you are always moving the unit around. Larger wheels are better because they don’t get caught in cracks and on cords. Automatic Cycle Feature – You couldn’t have given me an automatic cycle flash-cure unit – UNTIL I TRIED ONE. I wouldn’t be caught dead without one now. A unit like this will more than pay for itself in even curing and less guessing time. You know “do you think it’s cured? I see smoke – it must be.” O.K., so these things are like buying a Cadillac. You really will get your money’s worth. Heat Controller – This is one of those things I have a hard time saying to get the best in. Since you are generally going to run your flash-cure unit full on you may not need a heat controller. I get in trouble with the manufacturers who say you need to control the heat, but frankly, I don’t want my heater to be cycling on and off all day long. Dryers come in all sizes. A small dryer in one shop is a giant dryer in another. The following list should be looked at with your overall production and FUTURE GROWTH in mind. If you plan to print a few dozen shirts a week then a flash-curing unit will do forever. If you have lofty goals of being the T-shirt tycoon of your area, then get a dryer to handle your needs. Remember – as you grow the dryer is the first piece of equipment you outgrown! Conveyor Size – By my standards a small dryer is 6′ to 8′ long with an 18″ to 24″ wide conveyor belt. These dryers are just one step above a flash-cure unit and will handle from 6 to 12 dozen shirts per hour (regardless of what the manufacturer says). They are great for small shops but will not handle more than one or two printing presses feeding it shirts. If you can afford it buy at least the next size dryer larger. If you are looking at a 6′ belt length see if you can swing an 8′ or 10.’ If you are looking at a 24″ wide belt try to move up to a 30″ or 36″ belt. YOU CAN ALMOST DOUBLE THE AMOUNT OF THROUGH-PUT by just increasing the length a few feet! Adjustable Heater Height – This is nice but few dryers have this feature. By simply lowering the heating element you can get the ink hotter quicker (there is a point where you are going to burn shirts). This allows you to get that production higher on shirt jobs, and still fit puffy jackets and tall caps through the dryer when needed. It is the one area where you aren’t locked into a set heater height and a set amount of production. Don’t let the lack of this feature get in the way of buying a dryer. Ease of Maintenance – Sooner or later you will burn out a heating element or a temperature control. You need to be able to EASILY get inside the dryer to drop out a heater or do other electrical repair. Even if you aren’t the one who will fix it – someone has to be able to take it apart. Some dryers have so many “pop rivets” and twists and turns that it takes days to get the thing apart. Again, you will never know you need this feature until you realize that somehow you have got to get the dryer fixed QUICKLY so you don’t lose too much down time! Forced-Air – This is only a feature if you will be printing with air-dry inks for towels, non-textiles, etc. Although it MAY help minimize scorching, you will find that forced-air flowing through the dryer may also cool down the ink and keep it from curing properly. Although many manufacturers claim you must have forced- air (and preferably hot air) flowing through your dryer – there have been millions of shirts printed at high production rates without forced-air in the dryer. If you are printing with waterbased ink and especially the “new” discharge ink you really need forced air! Paper Thermometers – These were the standard way to test temperature for years and are still used. Although they are only accurate within 15 degrees (if you are lucky), they are the least expensive and “close enough” item we have. If you can get one to turn black at around 330 degrees, then you know you are probably running AT LEAST 300 degrees based on the heater height, temperature and belt speed setting.When people call with curing problems I always ask how hot was the dryer? When they INVARIABLY say they ran out of paper thermometers it becomes hard to help them. If you cut these little guys in half (the thermometers not the person with the curing problem) they only cost $ .25 each. That’s cheap insurance. Temperature Probe – A more accurate method of checking the temperature the ink reached in the dryer is an infrared pyrometer or infrared thermometer. These are hand-held “probes” that you point at the ink when the garment leaves the dryer and it will read the surface temperature of the ink. Granted, if you are printing a thick deposit of ink you may not get an totally accurate reading, but if you are tired of buying paper thermometers then a probe may be the answer. These use to be very expensive but you can now get one from your screen print supply company for under $100. A must have! I hope this article has given you a “cure all” for your curing needs.